Mike and Jason of Urban Build Inc.
We are in the final phase of a garage conversion which has gone unbelievably well and quick. The biggest chore in fact was clearing out, recycling, using, giving away 10 years of stuff from the garage so it could transition to its new self. 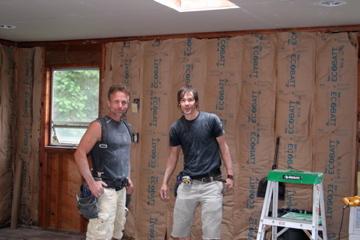 We sort of had the insulation and demo lined up and were looking for drywallers when I had a moment of clarity. It went like this: couple months back we had a repair which required a full day of my presence at home. I arranged it, canceling meetings and such, basically a day of work lost but it had to be done. So here I am, waiting…waiting. Finally the guy calls and says he’s coming from North Seattle, is stuck in non-moving traffic on 5 and won’t make it that day. The whole day? Yeah, whole day. Too late to pick the shambles of my schedule up and too late to find a new company to work with. So when I started to get bids for the drywall on this project, I recalled that and revised my craigslist search to <drywall west seattle>. I found a few names, one with a website I could refer to , Urban Build Inc–local guys, they live near Alki, so I gave them a call. 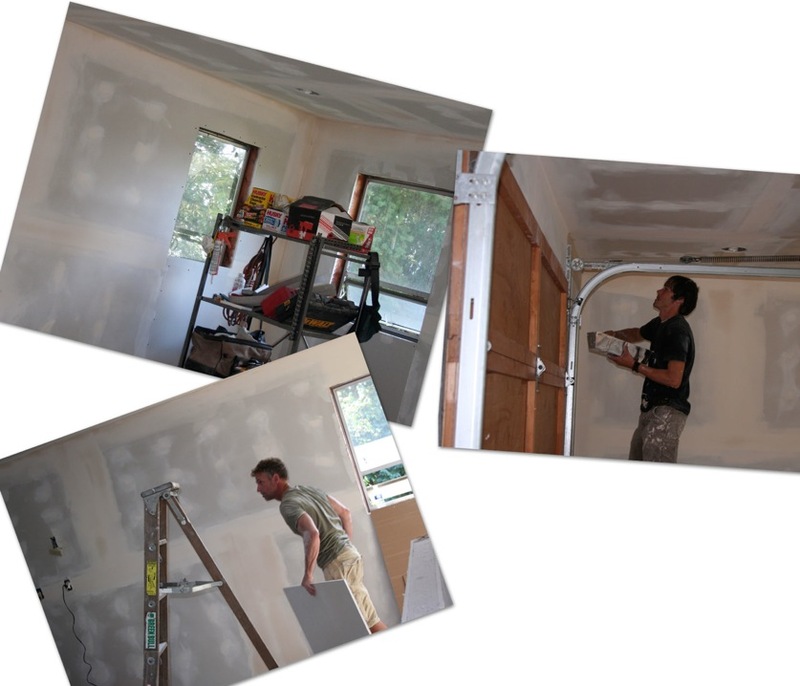 They came by that afternoon…and after talking with them, I decided to ask how they would do the whole job, not just the drywall. Cut to the chase, their bid was fair, clear and made sense, so we gave it a shot. Fast: Since they were local, they could drop by to view the site on their way home from the project they were working on and give me a bid by the end of the day. Immediate turn-around. Conscientious: avoid unnecessary waste, mess, or toxins. Experience: Their professionalism took me by surprise–I don’t know, sometimes I have low expectations of craigslist. These guys take enormous pride in what they do and how they interact with the client. Communication: clear, easy, consistent. Super-value add: they listen. Can-do: There was virtually nothing I suggested that they said couldn’t be done. That sounds weird but we’ve worked with a few guys who were all “oh no, you can’t do that. you’ll have to tear the house down to do that.” Really. Mike and Jason might add some ideas or explain how we might do it differently but “no” just isn’t part of their vocabulary. Magic: They said what they were going to do and then, magically, they just did it. In my experience, this is unusual. Work ethic: Did I mention pride of work and ownership? Again, less common all the time, and the job they did was gorgeous. Design sense: they’ve seen a lot and have good taste–good ideas and suggestions. For Mike and Jason, it’s the art and mechanics of the job, not just the muscle and know-how. These guys are keepers and they are right here on The Rock. They work all over, of course, eastside, north and south, but my preference is to keep things local when I can–especially with the price of gas and traffic issues we’re having just now. If you need a contractor who can do it all, elec to drywall and plumbing, give these guys a shout. Also, just so’s you know I’m not overly partial, here are some rave reviews from West Seattle Blog and Yelp.